Born in 1951. B.Sc, M.Sc, D.Sc. in Geophysics at Kyoto University. Visiting Fellow at Southampton University, 1980-1981. Lake Biwa Research Institute, 1983-2005. Lake Biwa Environmental Research Institute, 2005-2012. Chair Professor at Ritsumeikan University from 2012. Principal Researcher at Underwater Technology Center of the National Maritime Research Institute from 2014. Overall Coordinator of BITEX 1993, in 1993. Editor-in-Chief of Limnology from 1999 to 2001. Japan Water Prize for Promotion in 2004. SIL Baldi Memorial Lecture Award in 2007. Associate Editor of the Inland Waters from 2011. 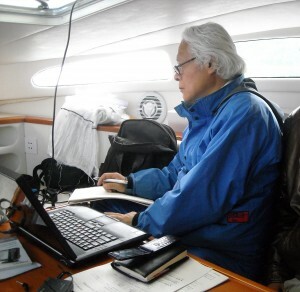 Co-Chair of ASLO-Japan Aquatic Sciences Meeting in 2012. President of the Japanese Society of Limnology from 2012 to 2015. “Lake Biwa is Breathing”. Kaimei-sha. 2015 (in Japanese). “Rapid and highly variable warming of lake surface waters around the globe”.